For parents looking for easy ways to organize the family, especially once the hectic school year begins, putting kids' clothes in bags for each day of the week is a tool just about anyone can use. When you spend money on cute girls clothes or cute boys clothes, you don't want to see them discarded on the floor. You also don't want to rush around the house when you have somewhere to go, looking for a stray sock. 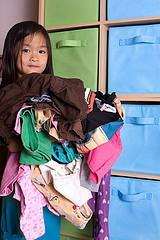 Organizing kids' clothes helps not only for school days, but also for sports and other extracurricular activities. You may not need to do this on the weekend, but it's a useful system to have in place during weekdays, particularly during the school year. It can make getting ready in the mornings easier, which helps kids and parents alike start the day off right. Organize on the weekend for the entire upcoming week or do it each night in advance. Write the day of the week on each bag you want to use. This can be Sunday through Saturday or only Monday through Friday. Decide what your child will wear and make sure to include an entire outfit: this includes a shirt, pants, shorts or skirt, boys socks and any other accessories such as girls leggings. Fold or roll the pieces neatly and place them in the appropriate bag, one outfit for each day. Seal them and place them in a designated storage area. This may be a vertical canvas shelf; it could be on top of a dresser drawer, with bags arranged in chronological order. Use a system that works for your family. Besides helping with organization, putting kids' clothes in bags for each day of the week also helps children become more responsible. Once a child learns to read the days of the week, he can pull out his own clothes and get dressed. Also, the plastic bags are reusable so there's no need to rewrite the weekdays every week. Simply put a new outfit into each bag for the week or the next day.This can also avoid the hassle of fighting with a child over clothing choices in the morning, which is no fun when you're trying to get everyone out of the door on time! Sometimes kids put together an outfit which makes their parents cringe; they pair polka dots with zigzag stripes and then want to wear rain boots on a sunny day. By preparing in advance, when there's no pressure, kids and parents can agree (as much as they can) on what to wear the upcoming week. When children will be away for an extended period of time, organizing clothes this way makes it simple for them to choose an outfit. This may be a big help if they're going to camp or when they stay with grandparents or other relatives. For parents who have more than one child who they want to organize this way, just add the name of each child to the bags to avoid confusion. You can also try color coding systems of using different color markers for different kids. When you need organizing tips, remember that what works for one family may not work for another. Use what works for you to make this system effective. By setting aside a time to do this in advance, you're fostering organization, independence and responsibility, traits that everyone can use.